Now, here’s something that may surprise you about one of the capital’s most well known districts. People have lived in the Ealing area for over seven thousand years, according to archaeologists. As history goes, that’s not bad at all. But there is more to Ealing’s history than that. Apparently a fair number of the districts old inns were the favourite haunt of many a highwayman. Thankfully, times have calmed down a little since then! Of course, highwaymen aside, those old inns would have been atmospheric places and there is a chance that the odd hog roast would have taken place in many of them. Strange then that history is beginning to repeat itself, because the hog roast is starting to re-emerge as a new catering favourite at events and functions in the area. Hog roast Ealing is with us once more. Hog roast Ealing may have had a rather unlawful past with all those highwaymen hanging about (before they were hanged, of course) but modern Ealing is a flourishing district. And just like any such area, there is always a need for functions, events, corporate evenings and of course weddings, christenings, birthdays and anniversary celebrations. Whether these are held in hotels, halls, houses or gardens is one matter, but the catering of choice is another matter entirely. For years and years, catering options for events like these has been a little lacklustre to say the least. Of course, people don’t complain but you just know that, the next morning, they will have a private moan about having ‘the same old boring food again’. It’s a shame because you surely want friends and colleagues to enjoy every aspect of an event that you organise. With a hog roast Ealing event, you can guarantee that the only feedback about your catering will be completely positive. It is a little bit odd how hog roast ever really fell of the radar when it came to event catering. It is after all perfectly geared up for big events where you need great tasting food for a large number of people. It served the medieval diners very well and it is serving twenty first diners equally well. 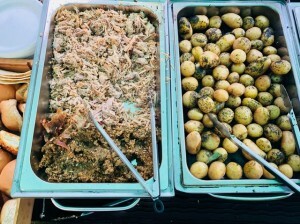 There’s something quite rustic and warming about hog roast and that could explain why so many people love it so much. Adults love the traditional flavour of the slow cooked pork, and children seem to adore the novelty value of a whole pig being cooked right before their eyes. That cooking process really is a major part of the appeal. Yes, hog roast tastes incredible and the long slow roasting really does boost the flavours. After six hours, it should do! 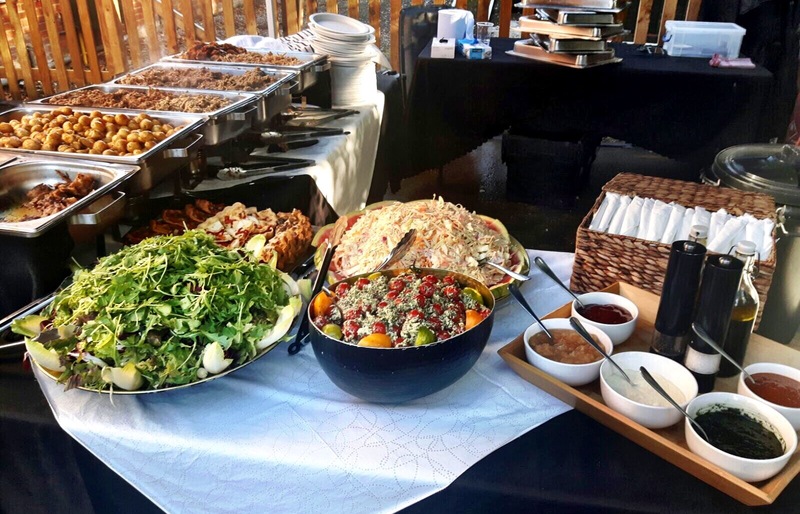 And the Ealing hog roast chef only ever uses great quality meat from a reputable source, which is a really important factor, but your party may be most impressed by the hog roast visuals. A whole pig on the impressive hog roast machine, filling the air with incredible pork aromas. It’s a truly wonderful sight and one that you should make a feature of your next Ealing event. 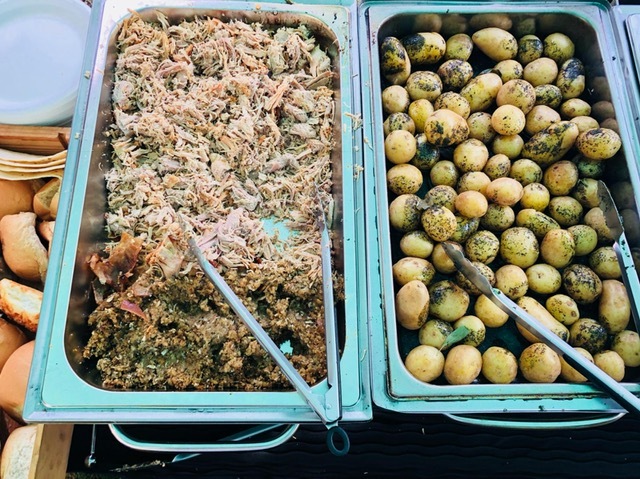 We recently catered at a wedding party in the docklands area where our award winning catering staff roasted an extremely large pig for the 150 guests. We arrived at the event at around midday to set up at make sure everything was ready for the guests as they arrived. They were met by canapés as they began to arrive. The bride and groom arrived and were immediately met by applause, it was at this point we decided to show all the guests to their seats and serve the wedding meal. With some succulent pork, various choices of salad and roasted new potatoes in rosemary and garlic on the way, the guests anxiously peered over to the serving station and got ready to rush up and claim their meal. We served chocolate torte and summer pudding for dessert which went down a treat with all the guests, especially the children who attended.